I checked out the video Stay alive! a guide to survival in mountainous areas from my local library. According to the host, Preston Westmoreland, if you have ever heard the idea that you could add whiskey to water to clean the water than that is not true. Ummmmm, I have never heard that, in fact if one googles adding whiskey to water what one discovers is that most feel this is a waste of good whiskey. The video visits with Peter Bigfoot, which is awesome because I really like that guy. Bigfoot covers the edible plants of the desert. July is the best time to eat Saguaro fruit. Peter also eats the hedgehog, he mentions it is better with salt, hey that’s what I said! The hedgehog cactus might be a quarter of its size in summer. Some plants are poisonous for some of the year and then not poisonous for other parts of the year. Great. 90% of prickly pear plants are poisonous, yikes, only eat the fruit, that was the next plant I was going to try so I am glad I watched the video first. Mesquite is the “mother tree” of the desert. He does not elaborate on why it is the mother tree. To clean water use 2 drops bleach per quart. If one ever needs to make a fire to signal for help while stranded in the desert, the black tubing in your engine makes for good black smoke. Thank god tube socks are out of fashion. I have come to the sad conculsion that I am not in any kind of physical shape for the apocalypse. I just read the pre-notes for the Survivial School I am taking this weekend. The first piece of advice he gives is to arrive to the class in shape. Apparently wandering around the desert all day looking for edible plants can wear a man out. The improtance of being in physical shape is one of the best things one can do to get ready has popped up multiple times in prepper books and forums. I believe I am in the worst shape of my life. The 6 mile hike I did a couple of weekends ago zapped me for two days. Unfortunately, it is difficult for me to find the build the habit of exercising on a regular bais. Lately I have been thinking that maybe a goal would help and then the warrior dash crossed my radar. I missed the one held last weekend, but perhaps I should set the goal to run the “3.4 Hellish Miles” next year. Assuming society still exists come April 2012. In the meantime, I have been doing more of the the only type of execise I really enjoy, which is hiking. This week I managed to go for three steep but quick hikes. Next weekend I am taking a survival class for four days, we are going to walk a lot. I hope I am ready. Below: Saw this tree blooming in the desert. Anybody got any idea what it is? It is pink flowers, and short stubby leaves. More photos at the flickr page, follow the link from the photo. As part of my research on how I should spend my vacation time, I have been checking out what survival schools I could sign up for. The one I ended up settling on is the Ancient Pathways’ Complete Survivor class near Flagstaff, AZ. The class covers edible plants, deadfalls, snares, and game preparation. What I am most excited about is making jerky, I love jerky! Who doesn’t? (I mean, besides vegetarians. Sidenote: How do you find a vegetarian at a cocktail party? Don’t worry they will find you. ) At first the cost for 4 days of instruction seemed a bit steep but looking at other survival courses it is not so much. I have to get a hunting license for the class. Cody Lundin in Prescott, AZ is famous from being on the cover of Backpacker magazine, Discovery Channel, and Dateline NBC which has also added to the tab for his courses. If money was no object I would take his Self-Reliance Symposium class, 7 days at $1790 which covers all sorts of stuff, and prepares one for living off the grid. He also has classes on “off the grid” living and other survival skills. Bring your own coffee, he doesn’t believe in it. Another local is the AZbushman. I have not taken any of his classes, but I really like his videos on youtube. The person probably best known in the United States for wilderness survival skills is Tom Brown. For example he was the technical advisor for the film The Hunted starring Tommy Lee Jones. His Tracker School has the longest list of classes, but his website could use a little work. It was tough to figure out which classes were actually happening. Plus the classes are in New Jersey, which I also find a little funny. I figure I should take classes in AZ, because that is where I will be when the SHTF. Wikipedia has a good links of articles he wrote for Mother Earth News. I ended up going with the Ancient pathways because their site does not emphasize one man. Wilderness survival should be about how anyone can do it, and by empasizing one person detracts from this in some subtile way. Plus I am a little jealous of how manly all their names are. My parents told me that they were going to call me “Adam” and my grandmother responded, “What?!? Adam! As in Adam and Eve? What else you got?” In the moment of panic they said “Kevin”. I think I would have been taller if they had stuck with Adam. Above: Kindling I tried to use at my first attempt and building fire with two pieces of wood. I got about 30 oranges on my tree in the backyard this year. It is my understanding that it is about the 6th or 7th year that one actually starts to get fruit from a citrus tree. I think I am now at that point. 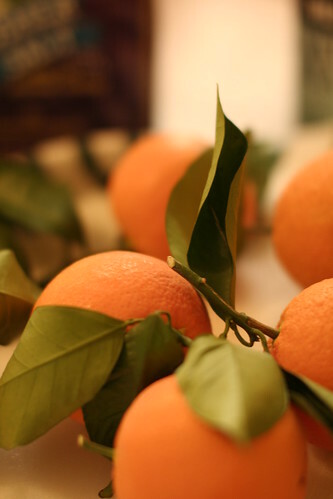 Last year I got three oranges, and they were sweet and delicious. The years before I had none. Fertilize the tree. Fertilize this summer and again in November or October when the tree first starts producing the fruit. Fish can be used as a fertilizer. You bury the fish by the tree. Maybe I can catch a fish in the canal for this purpose? Prune the tree. The tree has never been pruned, it is best to not prune the first five or six years, so now is the time. This will lead to less energy being spread out too thin. 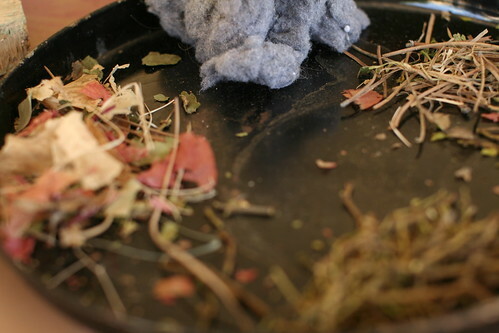 When pruning remember, the best compost below a tree is debris from that tree. 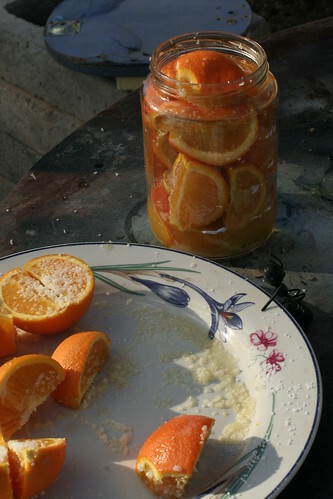 So the fruit is not super sweet, but I don’t want the oranges to go straight to the compost, (on a side note the internet gives mixed opinions if oranges are good in a compost pile) so I tried too experiments. The first is salted oranges, which is a twist from the salted lemon recipe over at stitchandboots. 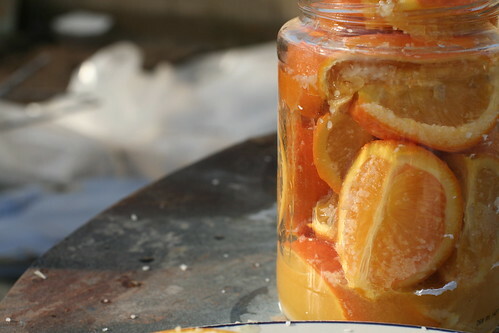 The process is to cram the oranges with salt, squish them into a jar, and then let them sit for four weeks. So I will let you know a month from know how they turned out. 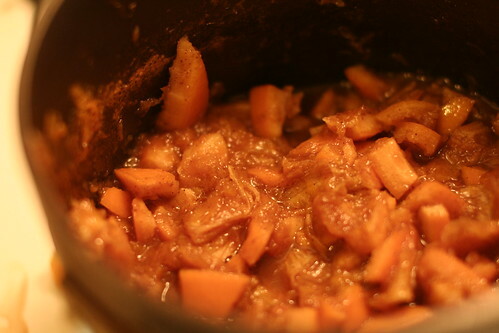 The second experiment was to make Orange Jam, using this video for instructions, but the marmalade was not so good. 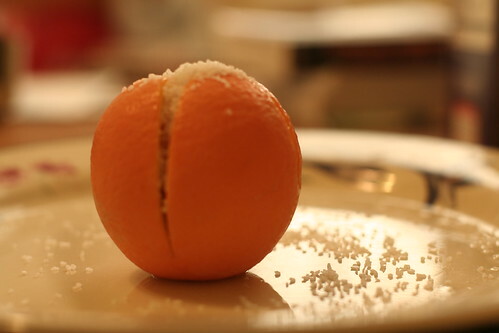 I think it is more my fault than the recipes, because I did not really measure anything and think I put way too little sugar in and way too much of the orange peels in. 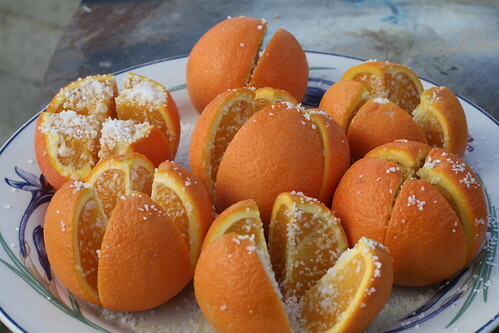 However, my thinking was after the apocalypse one might not have access to a lot of sugar, and also the etiquette would be to waste nothing, so I used a ton of the peels. I also just added some spices that I randomly had in my spice cabinet that I thought would make sense, which was cloves and all spice. Using the “jam” tonight to marinate some chicken. Anybody know anything about canning oranges? Got a lot of oranges and want to can them for the end times. 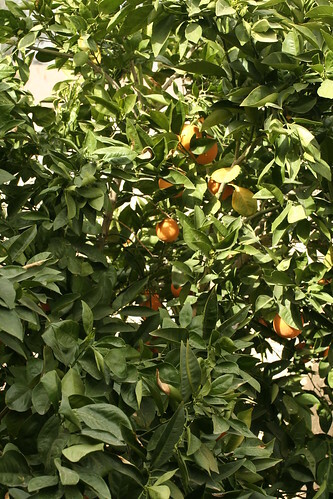 Below: My orange tree in the backyard gave out 20 oranges this year. Last year three. All the years before, none. Update: My friends over at facebook made a couple of good suggestions for links to check out. 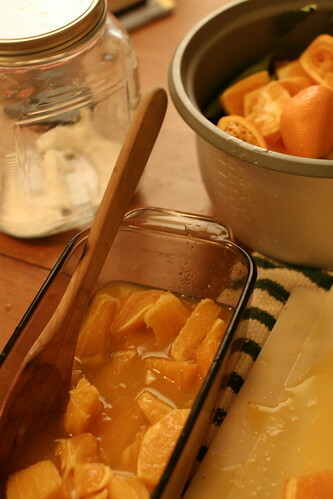 First is stitchandboots for recipes on how to preserve citrus fruit in various ways. Salted is recommended. Second is how to make some good old-fashioned moonshine. And lord knows I would love to get back to my roots. I been studying desert trees because The Arizona Desert Botanical Garden is going to have their spring sale on March 18 and 19th, and I want to know what I should get to add to the backyard. The Velvet Mesquite is the best type of mesquite tree to plant. Pick the bean (or pod) from June through early August. There is a tight window because you want the bean to be dry (it should come off the tree easily) but before the monsoons hit. Milling is a process to pulverize the bean into a protein rick powder similar to flour. The husks is where the flavor is and the protein is in the hard seed. Milling is done in fall. It takes that long for the moisture to get out of the pods. Store in a manner that the Bruchid beetles inside the pods can hatch and escape. The Bruchid beetle is harmless. Desert Harvesters is a great site about harvesting food from Desert trees. The Arizona Desert Botanical Garden is going to have their spring sale on March 18 and 19th. I am getting ready by figuring out what plants they will most likely have that would be good to have growing in the backyard for when civilization conks out. Thanks to itsadisaster over at the American Preppers Network Forum, I found the great Desert Harvesters website. Along the left side of the Desert Harvesters site is the list of trees that provide food and also tons of great information. I will be looking for..
Mesquite (already two in the backyard). The Velvet Mesquite is the best type of mesquite tree to plant. 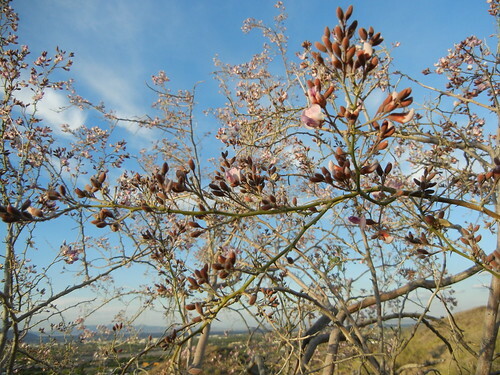 Palo Verde. The Foothills Palo Verde has better tasking (sweeter) seeds than the Blue Palo Verde. shots from 4 years ago, trees purchased at last sale I went to.